"This is a great OTELLO in fabulous sound. There have been a number of Martinelli Met Otellos, and certainly Henry Fogel in FANFARE 37:4 thought this not the best, preferring a February 1938 account with the same principals. Yet this 1940 OTELLO appears to this commentator to have true power, especially in Immortal Performances' transfer. While Sony, when it issued this performance, used Tibbett's private recording, Immortal Performances has used original transcriptions that needed loving preparation for this public release. It would appear the work has paid off. There is more immediacy to Immortal Performances' transfer of the opening storm; the Sony sounds painfully thin in comparison. The scope of the dynamic range in the Immortal Performances release is also preferable. Put simply, it has more 'life' about it. The conductor, Ettore Panizza, finds great delicacy in Verdi's fabulously varied orchestration; listen to the blazing orchestra just prior to Iago's 'Credo' (Act II). He paces Act II superbly so that the final moments really do take off, while the recording enables orchestral detail to come through even at higher dynamic levels. Even the off-stage trumpets announcing the arrival of the Venice delegation in Act III work well, and at the other end of the scale, the orchestral intimacies in the introduction to Act IV have terrific presence, while the strings immediately prior to Desdemona's final act prayer are tissue-delicate, each strand perfectly balanced and beautifully reproduced in this transfer. His orchestra is astonishingly well drilled. Listen to how accurate the lower strings are at speed, and how together the brass interjections are, at Otello's entrance in Act IV, after a protracted spell of slow, reflective writing. The pick-up is immediate. The opening chorus is magnificent here, the sonics stunning. 'Esultate' is remarkable, Martinelli's voice losing no bloom at full tilt high up, and is more present than on the Sony pressing of this performance; Martinelli's sense of command and presence at 'Abbasso le spade!' is also highly impressive. 'Già la note densa' is dark and unsettling. Also, it might be noted that Martinelli�s tone seems to come across a touch harder in the Sony pressing. In terms of performance and its Immortal Performances incarnation, we hear the full quality of Martinellis's voice, too, at 'Ora e per sempre' [and] at 'Dio! mi potevi', Martinelli's projection of Otello's desolation is visceral, while astonishingly Panizza has the Met strings match Martinelli in fragility of emotion, just as the orchestra matches the almost peerless explosion of fury just moments later. The cries of 'Un bacio' in Act IV are truly heart-rending, ending in an almost animalistic growl. The Iago is the fabulous Lawrence Tibbett; he entirely lives up to the orchestral preparation described above to his 'Credo'; also, Giordano Paltrinieri's Rodrigo works very well together with Tibbett, while Tibbett and Martinelli in Act II, as Iago poisons Otello's mind, is stunning precisely because each singer has such a grasp of the dramatic weight of each and every phrase. It's a pity that Iago's Act I Drinking Song is a little rushed, but that is the conductor's fault; Tibbett's 'Era la note' shows his other side, almost honeyed and impossibly gentle. The Otello/Desdemona duet towards the end of Act I is magnificent; and listen to how the little harp chords are perfectly placed. The duet builds to the most magnificent intimacy. This brings us nicely to how resplendent and pliably expressive Rethberg's voice is; and what a range of dramatic expression she finds in Act III. But it is in the fourth and final act that she fully comes into her own, her descending, sighing intervals a truly heart-rending expression of her sadness. As the act moves onwards with heart-stopping inevitability, Rethberg's capacity for inhabiting Desdemona's world becomes ever more remarkable. One hardly notices the control she has of each and every phrase. As Emilia, Thelma Votipka is the perfect foil for Rethberg. Nicola Moscona is luxury, and effective, casting for Lodovico. Sonics here really are first-rate, the chorus nicely preserved; only at Desdemona's entrance in Act II does the chorus sound muffled. I am aware of how Immortal Performances continually improve its efforts right up to the point of issue of its releases, and have been able to track some of this process in the preparation for this review. An A/B comparison with the Sony finds Immortal Performances by some way the more vibrant transfer, with the voices' natural timbres better reproduced, and with stunning orchestral detail. The Sony sounds rather muffled generally in comparison; those collectors who own it would be well advised to obtain the Immortal Performances pressing and perhaps treat the Sony as a something of a supplement from here on." "Without question, Martinelli's Otello was one of the great operatic portrayals of the 20th Century. Martinelli achieved this without the natural gifts of the very first Otello, Franceso Tamagno, and his most obvious descendent (at least in terms of vocal endowment), Mario del Monaco. Both Tamagno and del Monaco possessed huge, trumpet-like heroic tenor voices. Martinelli's tenor, more in the lirico-spinto mold, served him well in a wide variety of Italian and French repertoire. But what Martinelli lacked in sheer vocal weight, he more than compensated for with fearless attacks, brilliant and focused tone, superhuman breath control, and remarkable stamina. And then, there was the artistry. No one ever declaimed Otello's text and music with greater nobility, clarity, and dramatic meaning than did Giovanni Martinelli. There was another secret to Martinelli's sublime achievement as Otello that was, in truth, no secret at all. Martinelli was scrupulous in respecting Verdi's score, and the numerous directives the composer provided his artists regarding articulation, dynamics, and expression. By strictly adhering to Verdi's edicts, Martinelli revealed the unique and essential greatness of this singularly challenging tenor role. Combine Martinelli's devoted adherence to Verdi's score with his individual and inspired artistry, and the result is an OTELLO for the ages. While it is true that while in the 1940 broadcast Martinelli is not in as fresh voice as in the 1938 performances, he is still, by any reasonable standard, magnificent (the 1941 broadcast documents a further and noticeable vocal decline). And we are fortunate that when Martinelli performed OTELLO at the Met, he was surrounded by principals who were very much his equal. 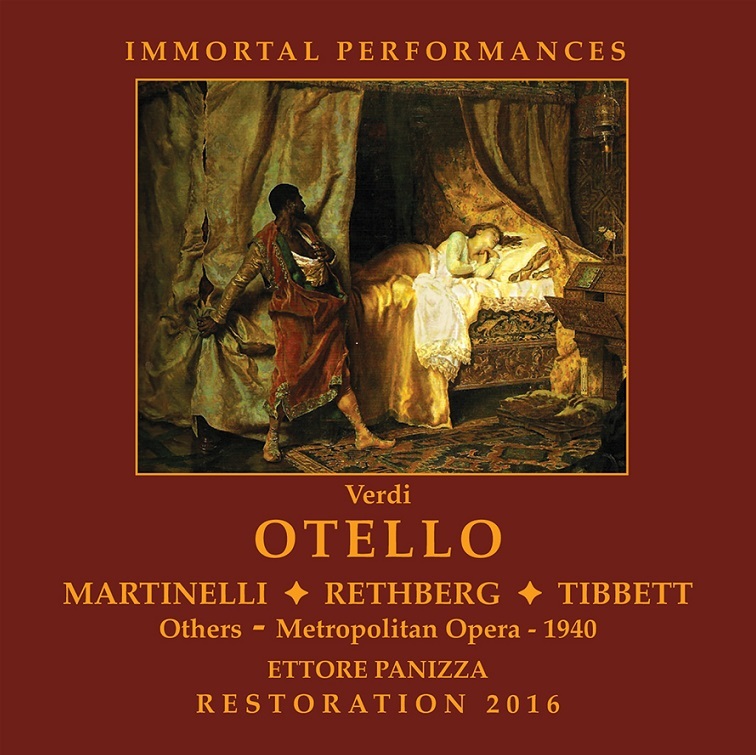 It's worth noting, too, that by the time of this 1940 broadcast, Martinelli, Rethberg, Tibbett, and Panizza had performed OTELLO together numerous times, and that experience pays great dividends in the way the artists play off and complement each other. Like Martinelli, Lawrence Tibbett was in better vocal form for the 1938 broadcasts. But his Iago in the 1940 performance remains impressive; richly sung, superbly declaimed, and brimming with personality and dramatic involvement. Elisabeth Rethberg's radiant Desdemona, in exquisite voice, portrays the heroine's love for Otello, confusion, and despair with total vocal and dramatic commitment. Conductor Ettore Panizza leads a performance that juxtaposes volcanic momentum with a frequent repose and flexibility that afford his magnificent cast the opportunity to do justice to Verdi's great achievement. The previous Met LP and CD issues of the 1940 OTELLO broadcast were derived from an off-the- air transcription, made at Tibbett's request. The compressed but reasonably detailed sound is what one might expect from recordings of this source and vintage. The Immortal Performances issue is from another source, one that Richard Caniell has painstakingly remastered. The results are astonishing. All of the voices, as well as the orchestra, emerge with a previously unheard richness, color, and definition. While the sound is perhaps not quite the equal of a commercial recording of the time, it certainly approaches that level. It is no exaggeration to say that the Immortal Performances remastering will allow you to experience this OTELLO as never before. The booklet includes Henry Fogel's affectionate, incisive, and beautifully written appreciation, a detailed plot synopsis, artist bios and Richard Caniell's notes on the restoration of the recording. Of the four Met OTELLO broadcasts with Martinelli, the February 12, 1938 performance features the principals in their best vocal form. 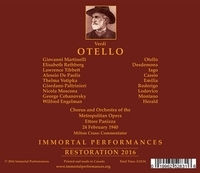 However, the recorded sound, even in Ward Marston's superb remastering for Naxos, does not begin to approach that of the Immortal Performances release of the 1940 OTELLO. 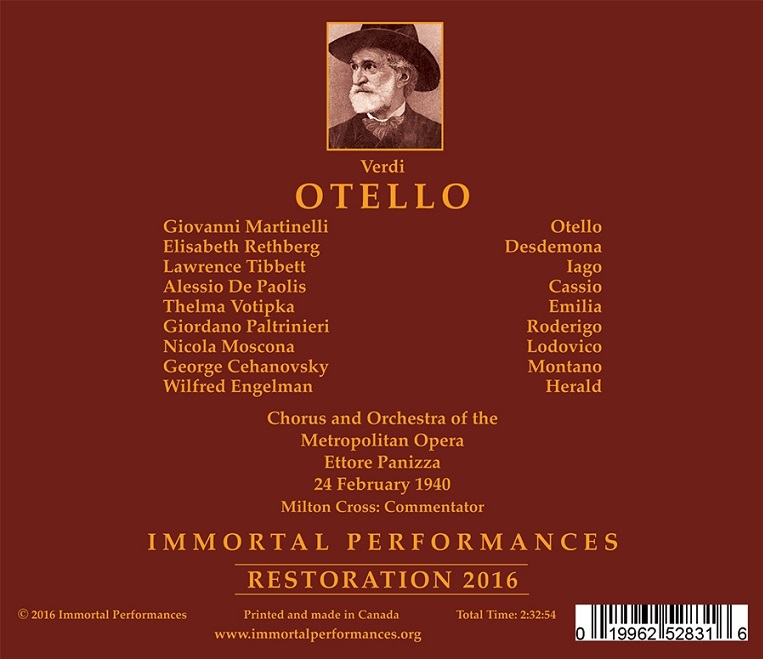 You should probably have both in your collection, but this Immortal Performances release is the clear starting point to savor one of the great achievements in opera history." "...almost every phrase comes to take the impress of [Martinelli's] voice and style. The taut concentration of tone matches the intensity; at every point a close and receptive study of the score has yielded its reward. Walter Legge reported of his singing the role at Covent Garden in 1937 that 'a thread of pure gold runs through his voice', and he added that it was 'unlike any other tenor in the world today' save possibly the young Jussi Björling, 23 years Martinelli's junior. At its best, as in the monologue, Martinelli's Otello remains finest of all. Tibbett's Iago is superbly caught, the best account of the role on records, not forgetting Gobbi. Like Martinelli, his response to every phrase is specific and vivid; and his voice resonates richly."